A typical meeting often involves exchanging names and a handshake. But when four women each take a seat at the Joseph W. Schreiber Memorial Organ for the November Organ Recital Series, introductions will come by way of the press of a foot pedal or key and musical notes. “Getting to know a new-to-me organ is like getting to know a fascinating new person. I absolutely love the process, finding out: What are its strong points? How can I enable its unique voices to sing at their best? What new combinations of sounds can I discover?,” says organist Jan Kraybill who is the organ conservator at the Kauffman Center for the Performing Arts in Kansas City, Missouri, USA, and organist-in-residence at the international headquarters of Community of Christ in Independence, Missouri. "An organ is an instrument of breath and wind. Each one is unique just as each human voice is unique," says Caroline Robinson, the minister of music at St. Paul’s Lutheran Church in Pittsford, NY. “I think things that I most cherish and look forward to each time I sit at a new instrument are what it has to teach me, and what sounds or characteristics are unique to it that I can hope to use in a beautiful way that emphasizes and enhances those things,” adds organist Damin Spritzer, an assistant professor at the University of Oklahoma with the American Organ Institute and the Cathedral Church of Saint Matthew in Dallas as artist-in-residence for Cathedral Arts. These organists will have the opportunity to meet this new friend, Independent Presbyterian Church’s Dobson Pipe Organ, on Sundays in November. This organ recital series, which has featured more than 160 artists since 1965, will welcome Robinson, Kraybill, and Sprtizer, as well as Dongho Lee, artist-in-residence at Providence United Methodist Church in Charlotte, NC and director of Music Ministries and organist at First Presbyterian Church in Belmont, NC. Each one has at least one favorite piece that they look forward to hearing on the Dobson. Robinson looks forward to "the whole thing." Lee cannot wait to hear how the Dobson handles repertoire spanning three centuries. For Spritzer, it’s Tuba Mirabili because of her love of English organ music. Kraybill’s choice will be rooted in the importance of the day her performance falls on- November 11, Armistice Day which marks the 100th anniversary of the end of World War I. “This organ's majestic trumpets and gorgeous strings, and everything in between, will contribute great emotion and beauty to the program I've designed, simply called 'Peace.' I am so looking forward to playing it there,” says Kraybill. All of these women were drawn to the organ’s “majestic and beautiful” sounds at a young age. 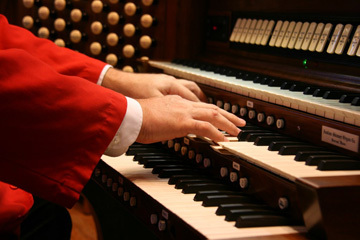 Some followed their family’s love for organ music. Others were encouraged by organists at their childhood churches. "What inspired me to become an organist is what inspires many to do so: the power of the instrument in the building. Nothing else, except maybe an earthquake, can shake a building to its core in a way that the congregation (or audience) can feel. I loved the way I could feel the building move when the instrument roared. I also loved its more tender moments. There’s a range of expression that few instruments can achieve," says Lee. Over the years, these organists have travelled the world performing and earning accolades for their musical gifts. Each will add Independent Presbyterian Church to its performance venues in November. Don’t miss these performances on Sundays at 4 pm. It’s the Music & Fine Arts' gift to you and the community.